MOSCOW (Sputnik) - A graffiti depicting Brazil star striker Neymar is being painted in the Russian city of Kazan, which will host Friday's quarter-final clash between the five-time former World Cup winners and Belgium, a Sputnik correspondent reported on Thursday. The graffiti will grace a wall of the school across the street from the hotel where Brazil will be staying. The artists behind Neymar's portrait earlier created the murals of Argentina captain Lionel Messi before Saturday's round of 16 match against France and of Portugal captain Cristiano Ronaldo during the 2017 Confederations Cup. 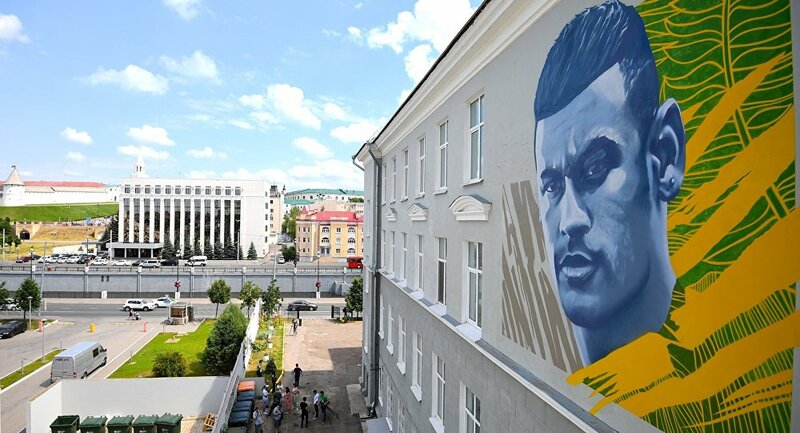 In 2017, Kazan mayor Ilsur Metshin told journalists that there were plenty of locations in the city where portraits of prominent footballers could be painted. The 2018 FIFA World Cup kicked off on June 14 and will continue until July 15, with the matches set to be played in 11 cities across Russia.